She poses this challenge directly to the candidates for the Labour leadership, whilst acknowledging that Jeremy Corbyn is the only one likely to listen. But she also needs to get this message across to those that perceive themselves as being of the progressive left in the Green Party and potential ally parties. 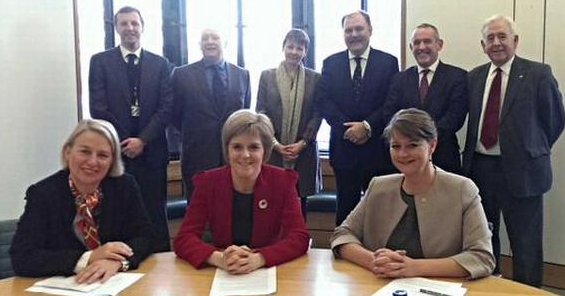 She recognises that there are members of the progressive left in the Lib Dems, the SNP and, of course, Plaid Cymru. I say ‘of course PC’, not simply because I am speaking from Wales, but because there can be no doubt that Plaid Cymru has the the greatest proportion of, and most committed people, of the progressive left than either the Lib Dems or the SNP (and maybe than the Green Party itself in Wales I suspect). This is confirmed by this analysis the parties manifestoes for the 2015 General Election by the Political Compass people. One strategy – which is my personal view and on which I would value contributions from others – might be to consider the potential for progressive pacts. A possible first step could be for Labour, Greens, Lib Dems, the SNP and Plaid Cymru to empower local branches with the ability to back candidates from other parties if they wish. Secondly, and in a transparent and open way, those of us who want progressive pacts could set out a core set of pledges that parliamentary candidates must follow if they want cross-party support. No doubt, for a local Green party to back a candidate from another party, that candidate needs to commit to serious action on tackling climate change, recognising that we must live within ecological limits, and take a very firm stance against further austerity and the selling-off of our public goods. Crucially, local voters would need to have their say and be properly involved – they’re the ones who should be the ultimate beneficiaries. Re the first part, it took a number of years for me and Bridgend Green Party to build a rapport with Bridgend Plaid Cymru members and reach a point where we could have sensible discussions about, initially, keeping out of each others way in our target wards, but latterly of perhaps taking that as far as openly endorsing each other’s candidates. However, I am no longer involved with Bridgend Green Party and it is now largely in the hands of enthusiastic newcomers (riding in on the recent membership surge), and I suspect collaborative progress has stalled somewhat. It was only ever, at best, an oasis of mutual respect in a desert of mutual suspicion and contempt across Wales, in terms of the attitudes prevailing in many local parties, and promoted by a few noisy, parochial, sectarian activists in both parties. These prominent personalities achieve undue influence and do untold damage to the cause. They are also expert in utilising social media to maximise the impact of their mischief making. In this context, Caroline is being naively optimistic if she thinks empowering local parties to do the right thing will actually lead to many of them actually doing the right thing. I suspect she knows this, but will be being careful to not fall foul of the Green Party’s constitutional emphasis on local decision making. She has already stirred voices of disquiet in Wales through some of her comments during the election campaign about supporting Plaid Cymru candidates where there was no Green candidate. I have heard newish Green members, that perhaps don’t know Caroline very well, preposterously suggesting she may have been ‘got at’ by the larger numbers of PC MPs. What they and others should know is that Caroline Lucas is the strongest and most astute of operators – the Party’s single greatest asset. Those that seek to criticise her for ‘interfering’ on their patch simply underline their parochialism. There is nobody in the Party that has done more to earn the right to have her opinion heard, and no one who has more right, as an individual, to seek to have influence over the direction of the party. At the end of the day, she knows she cannot force the party one way or the other, but she is doing what all good leaders do – i.e. show conviction in the right way forward. Re the second part of Caroline’s proposals, there ought not to be too much of a problem here – in theory. There is plenty of common ground that can be readily identified, and nothing that she mentions should be contentious. They are the natural enough ‘red lines’ that identify people as of the progressive left. There are, of course many issues that are harder to reconcile, but these are not ‘red line’ issues, simply areas of disagreement that give each party its distinct identity within a progressive alliance. If they are not kept this way, they become not just an obstacle to alliance, but, more importantly, a barrier to progress for any of us. This is where the the mischief makers focus their attention. They shine a light on areas of difference, often misrepresenting things as they do so, and try to assert ‘red lines’ that need not exist. They use issues that divide opinion, to a greater or lesser extent, within the parties – which is one key reason they cannot be allowed to be red line issues. As for Caroline’s last point, I am not sure how she envisages getting local voters involved in these tricky resolutions. The way I have always seen it is that whoever is in the best position locally should be the favoured candidate for the progressive left as a whole. This is giving the decision to the electorate. Where a party is in with a chance of a FPTP victory on the basis of past performance, then that party’s candidate should get endorsed without further contest. If it is not clear cut, and it is presumed that nobody from the progressive left is in a position to win, the next relevant election should be used to give the local electorate the opportunity to indicate who they see as the strongest option, and that leads to the selection of the favoured party/candidate thereon. This will not produce balance in the numbers of candidates from each party. The whole exercise is about getting progressive left candidates elected irrespective. It needs an attitude of self-sacrifice for the greater good. In Wales, there are possibly one or two Lib Dems and Labour candidates with decent progressive left credentials, but in the battle between the more avowedly progressive left parties of the Greens and Plaid Cymru, it has to be conceded that PC will dominate. After all, the Greens only outpolled PC in one seat in the recent General Election (take a bow Chris von Ruhland in Cardiff Central). There were a few where it was very close – where both parties were way off the pace – and I am sure PC would cede most of these to the Greens to develop. The Pirates and Left Unity, could perhaps be granted a target seat to take on and develop as their contribution to the progressive left alliance if they can show some support on which to build in a locale. But all this is, on my part and, sadly, Caroline’s part is little more than aspirational. The bottom up democracy of the Green Party makes it harder to achieve than, perhaps, in some other parties, especially at a time when members of a few months – of all manner of mixed, uncertain and often naive outlooks – greatly outnumber the the longer-established, experienced and savvy members. Add to this the fact that some of the longer-established members have their own agenda, and the experience to promote it at the expense of the common good of the party, and the progressive left cause in general (the really dangerous mischief makers I have alluded to already), and the prospects for the vision that Caroline and I share are not good. My inability to make the case forcefully enough to have an impact in Wales was no surprise to anybody (especially me). I hope and trust that the masses of new members in Wales wake up to the fact that Caroline is an iconic figure who transcends party and national boundaries. She is uniquely positioned and experienced within the whole progressive left movement. She knows what she is talking about. There is every possibility that Wales Green Party may be detached from the GPEW before long. Irrespective of whether this happens or not, for the love of everything you hold dear, take your lead from people like Caroline, rather than the ‘leadership’ you may be offered more locally. 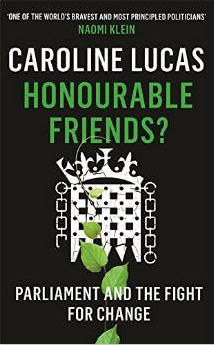 PS – I would urge you all to read Caroline’s new book. It gives testament to the experience and wisdom she has accumulated over the years. You could read Lucas’s book as an effective summary of key debates on the UK’s future. But even more powerfully, it opens the door on a political past we are condemned to live with and sniffs the stale air of an institution to where we outsource our democracy. Stepping back, it is not Lucas who looks all alone in Westminster but Westminster that looks odd and out of place in the world. Far from hanging up swords, you suspect that, by the end of the book, many more readers will want to take up theirs to campaign for change. There is so much we can learn from in this one short quote!! This entry was posted in Uncategorized on June 17, 2015 by Bridgend's Green Leftie.